This is about Adelaide’s Festival Plaza, for its reconstruction, which would include the destruction of its well-known environmental sculpture by Otto Hajek. The Festival Theatre precinct was built in three phases between 1970 and 1977. The Southern Plaza was finished in 1977, and was adorned with the Hajek piece. 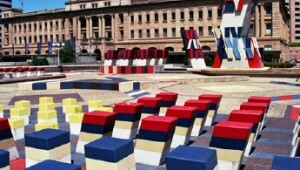 Hajek was German, and his sculpture is about Adelaide. Shortly after it was completed I attended a lecture he gave in Adelaide; he had travelled from his home in Germany, for the second time. During the lecture he related the experience of arriving in Adelaide for the first time, after he had been notified that he’d been engaged for the Festival Plaza work, and before he had resolved its subject and theme. In those days the journey from Europe was even more arduous than it is now – one had to transit Sydney after a flight of more than twenty-four hours, and take another aircraft to Adelaide. Hajek had arrived late in the afternoon, very tired and unhappy, and there was no-one to meet him. He made his way into town, and sat on a bench in North Terrace, and watched people hurrying home. In his jet-lagged and lonely state, Adelaide evidently seemed very bleak, a clump of high buildings surrounded by flat suburbs, tired people trooping from one to the other. This insight became the theme of the work he designed for the Plaza, flat polygons painted on the pavement with groups of uniform concrete blocks hurrying in different directions, and a high clump of monoliths. It may not be very flattering, but flattery is probably not a vital constant in an artist’s oeuvre. Most people would prefer an artist told the truth, and many great works of art are critiques of a city or its people – Bracks’s painting of Collins Street at 5pm is another example. The Festival Plaza has been much criticized over the years – it’s empty, it’s glarey, there’s never anybody there, etc. These things are true, but I for one rather like it like that, – the space is open and quiet, and the views of the railway station and parliament buildings are great – and the Plaza itself is not to blame. The fact that there’s no people there is the fault of the grand Dunstan plan for a precinct of big inside-oriented event venues. The only time people are out on the Plaza and other walks is when a show at one of the venues is starting or has finished, or the casino’s having a rush (which is never). The current plan has put a multi-storey building – one of a number suggested for the riverbank precinct – on the southern Plaza. This might generate pedestrian traffic, but it would mean the end of the Hajek work; there’s no way it could be ‘relocated’. The Hajek sculpture is probably the biggest work of art in Adelaide, and this is the point: it is a work of art. It raises a central question: what is a work of art worth to a city? Obviously if somebody thought that to generate some pedestrian traffic, it’d be a good idea to daub some extra oil paint over Tom Roberts’s “Breakaway” or Heysen’s “Mystic Morn”, there’d be an uproar. These paintings are much loved, they are treasures. But what if a piece was less loved, would it be OK then to damage or ruin it? Over time, works of art have sometimes been destroyed, particularly when they’re difficult to move, and the Hajek is not loved in all quarters. People I’ve discussed it with do have varying opinions, some like it, and some don’t. One opinion is that it’s just a decorated air-conditioning exhaust stack, and indeed the tallest ‘monolith’ does house an air-con exhaust, but it was not how it was meant to be. Otto Hajek said, at the 1977 lecture, that he was highly perplexed to find that the architects (Hassell) had fitted the exhaust into his sculpture. He was right, it demeaned his work. The Hajek sculpture is worth saving. It’s worth saving because it is a fine representation of a stream of thought – minimalism – which was a powerful current of the 1960s and 1970s, Hajek was a notable artist of those times, and he devoted much thought and effort to thinking about Adelaide, about us. It’s a great piece. It’s worth saving also, because there is little reason in the current plan behind its destruction. Removal of the projected multi-storey building by a few tens of metres would avoid the issue. It’s worth saving because it’s nice to be there, children like to play in it, and when they know what it’s about, it provides them with a new slant on their town, their people. It’s ours, why would we just allow its gratuitous destruction? Architect’s Office 1, Mount Barker, S.A.